Perfect Gift for Star Wars Fans. Personalized Star Wars Theme Wedding Cake Tipper. 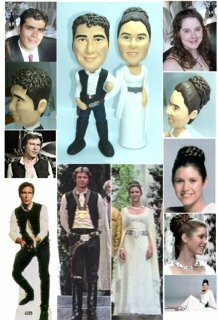 I hope the power of the force is with you if you decide this is the Cake Topper for you. * If you have difficulty uploading photos, please place your order WITHOUT uploading photos and then email them to Info@FunDeliver.com along with order number and instructions. If you want to add pets, please upload photo of pets at Additional Image section. If you want to add kids, please upload photo of kids at Additional Image section. If you’re not satisfied with the pre-made body styles, you can have a completely CUSTOM Made Figurine which is designed to your specifications in any theme you like. Please upload additional images of your designs. Please upload Additional Images, Background, and your Designs (Clothes, Pose, Color…Anything you love). If you have more than 3 Additional Images, please Email your Images to Info@FunDeliver.com along with instructions.